It seems that the high street has gone all out for retro with the new Autumn collections. Oasis even has a collection named Alfie which hopes to mix ‘"influences of the late 60s mod boys and their girlfirends. With a sharp blend of mannish tailoring and retro feminity." Correct me if I’m wrong, but I’m not sure it does actually reflect mod styling, as the dresses seem more floral than sharp, but odd pieces such as this preppy casual check shirt dress don’t look bad at all. 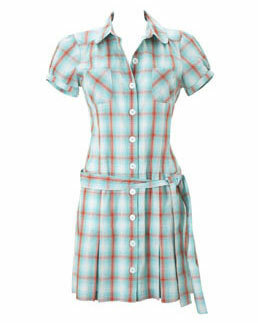 The dress is in light petrol with a red check. I’d like to point out all the features it has in common with "60s mod boys and their girlfriends", but about all I can think of is the material – you might see someone wearing a shirt made out of something similar! Still, it’s a decent retro-inspired frock at a reasonable price. You can buy the dress online or at one of Oasis’ high street stores for only £40. You can also view the rest of the range online. But if you’re looking for a female mod look, don’t expect too much.